According to Wikipedia, a standing desk is a desk designed for performing activities (such as writing, typing, reading, etc.) while standing up. One of the main reason why people (especially office workers) opt for such type of desk is due to its many health benefits. I mean, we suppose you already know that right?! But did you know how many different styles of standing desk exist? There are literally hundreds! And how do you know the good from the bad? Well, that’s where we come in. In this article, we will explore the Crank Adjustable Standing Desk, a manual standing desk sold by Stand Up Desk Store. Aside from reviewing this particular desk, we will also talk a bit about manual standing desks in general and the way they differ from electric standing desks. Alternatively, for more information about that you could take a look at our in-depth article that compares the best electric and manual height adjustable desks and desk converters, comparing all the pros and cons each style offers. Here, we will focus on the most critical features of this product: design and build, lifting mechanism, adjustability, beauty and comfort, durability, value, and some other minor factors. This desk is 59 inches wide, and 28.25 deep, with height adjustability ranging between 33.5 – 47.25 inches. The lower surface alters 29 to 43 inches, while the upper adjusts from 33.5 to 47.25 inches. It features a two-tier design: the top shelf is where you keep the monitor, and bottom for mouse and keyboard. 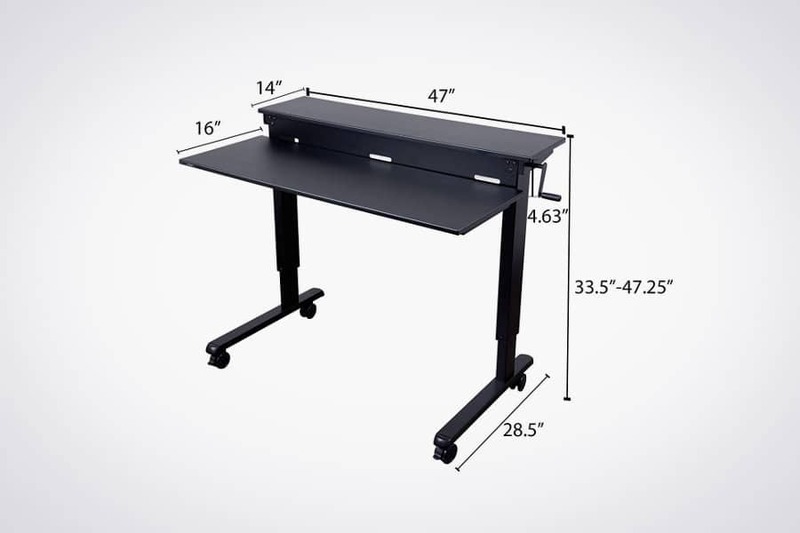 The desk is very sturdy, featuring a robust steel frame, and can carry up to 154 pounds. It is strong enough to carry dual monitors, stacks of paperwork, keyboard, mouse and other office equipment. And still, it does that without taking too much of your space. This desk also features four wheels, which allow smooth and convenient transportation, in case you want to move it or relocate it. Once you place it in the desired spot, you can lock the two front wheels. It is also worth mentioning that this desk meets the requirements of ANSI/BIFMA standards. The desk is purchasable in five different color combinations so that you can pick the one that will fit your office/room appropriately. Note that the desk is also available in a 48-inch size, ideal for those who seek small-sized desks. It is cheaper, but can carry less weight and, naturally, has less space (but also takes up less of your area, so, choose wisely). 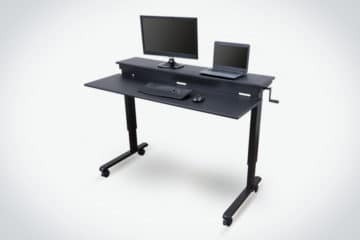 This is a crank standing desk, which means that it features a crank adjusting system. The crank can be placed on either side of the desk, and functions very smoothly, allowing you to morph it from standing to sitting desk, and vice versa. The crank is sturdy but isn’t bolted during the assembly process. Now, the fact that the crank isn’t bolted doesn’t seem to cause any issues with the cracking mechanism. In fact, we hear that the adjusting feels reasonably smooth, and is relatively straightforward. But, you can pull the crank out of its bearing on demand. Most people believe that this is the desk’s feature, not a design flaw. Let’s say you have to relocate the desk, with right side against the wall. If the crank were bolted on the desk’s right side, you would have to disassemble it and install it on the left side, which can be inconvenient. With non-bolt design, you pull it out of one side and easily plug it in the other. We doubt a lot of people value beauty, but believe it or not, the beauty of your workspace does affect your working performance. As one Forbes article put it, it is essential that the office is designed in a way in which the employees will want to show up to work, not need to show up. This desk is made of teak, finished with a vinyl veneer. It is actually quite beautiful, perhaps even unexpected for such price. More often than not you have to pay a lot more money for a desk that is both stable and beautiful, but this desk covers it all for a very affordable price. Note that the veneer is also reasonably easy to maintain, which is always a plus. But how comfortable it is? When we speak about comfort, we generally refer to desk’s ability to adapt to your body dimensions and working habits. Having that in mind, we can safely say that the vast majority of users commend this desk for its comfort. Having the option to sit or stand is very important in today’s working conditions, with more and more people opting to stand while they work. Still, if you get tired of standing, adjust it via the cracking mechanism to fit your sitting position. How durable is this height adjustable desk? Well, according to many positive customer feedback it is very durable. It combines teak with heavy duty steel frame, sturdy enough to support a lot of objects placed atop of it. The casters (wheels) are excellent and screw in the desk legs easily. Keep in mind that two of them have locks, and you have to install those at the front of the table (we will talk more about that later). If maintained properly, and if it doesn’t experience any severe damage, this desk can last a lifetime. Note that the steel is coated, and is resistant to oxidation, wear, and rust. In short, you don’t have to worry about the frame (regarding maintenance), and should only maintain the teak. 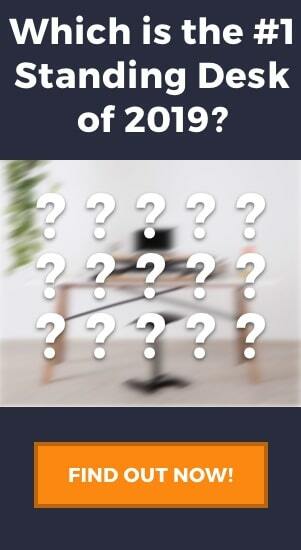 SEE THE BEST: We have ranked the best standing desks of 2019. Take a look at the full list here. Now that we provided you with an overall review of the table, it is time we discuss the most positive and the most negative features of it. This desk fits most average size people most likely up to 6′ tall. This manual standing desk uses the crank system to accommodate your size, ranging from 33.5 inches to 47.25 inches. It also is one of fewer desks that has the two-tiered design. This is more common among standing desk converters than it is with full tables. This feature means that your wrists can maintain a healthier, more ergonomic position compared to the height of the monitor. This is very important for your overall working posture. The cranking mechanism of this desk is phenomenal. The crank is very soft and operates very smoothly. Sure, it isn’t an electric desk, and you’ll have to crank it up or down manually, but users have had no issues with it jamming or deteriorating, even after long-term use. The crank can be placed on either side and doesn’t bolt on, giving you a lot of maneuverability. In fact, some people have suggested you use the crank only when you need it: you plug it in, adjust the table, and then put it away. That way you can save up even more space (if you need to, of course). We believe these things are all interrelated. The desk is made of a high-quality material; vinyl veneer finished teak and steel frame. Once assembled, the desk doesn’t jiggle as most poor quality desks do; it is very stable and sturdy. The sturdiness also affects the desk durability, in the sense that it won’t lose its initial quality over long-term use. It is made of pure steel, a material that doesn’t lose its characteristics that easily. The desk also comes with furniture class casters, which screw in the table. Two front casters can act as brakes, fixing the desk’s position, improving its stability and reducing vibration. Casters are also made of high-quality material, helping extend the overall durability of this desk. We believe the desk beauty also lies in its simplicity and compactness. It doesn’t take much of your space, but still provides you with enough room for your things; there is beauty in that. Instructions show a bolt going through the supportive steel tube beneath the keyboard; that bolt, the one presented in the instructions, is far too big for the job! Now, if you use the screw the bolt recommended by the instruction manual, the bolt will go through the tube, into nut built-in on the other side of the desktop. If you continue screwing, the bolt will penetrate through the tube, causing damage to the plastic desktop. And even after you screw it, almost penetrating to the other side of the desktop, the half of the bolt will still be sticking out of its position. So, if you do according to the instructions, you will create a lump on the top side of the keyboard desktop area, and the bolt will still be out of the position. Furthermore, the instructions are just pictures and no words, which is maybe ok if you are an IKEA wizard, but it definitely could be improved for us regular folk! But that’s pretty much it, that is the only real downside of this desk. We could say that there are two downsides, but the issues are connected: the desk is challenging to assemble because the instructions are unclear and misleading. The product we reviewed is a manual, crank adjustable desk. Manual desks are almost always cheaper since they don’t feature sophisticated height-adjusting system. However, electric desks are almost always better in the domain of weight capacity, and can often carry more weight. Also, they are far more convenient, due to the automatized height adjusting system. But, if you are working in an office with multiple people, you have to be careful about the motor noise. There is no definitive answer here, and no one can say that manual desk is better than the electric, but it is less demanding. It requires no electricity (you don’t have to sit next to an electric socket), it costs less and is much simpler to maintain. One thing is certain: the reviewed, Sit To Stand Crank Standing Desk is durable, sturdy, adjustable and comfortable sit to stand desk. It is beautifully designed and well crafted, loved and recommended by many of its users. One of the most simple yet fantastic features is the two-tier design which makes it even more ergonomically friendly and means you probably won’t need to buy a monitor stand, saving you a little bit extra. 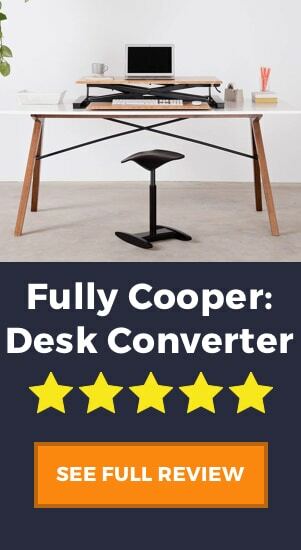 Above all, if you are looking for a cheaper entry into the world of standing desks, which can be quite expensive given the prices of some other product, then we think this is a great entry level product. 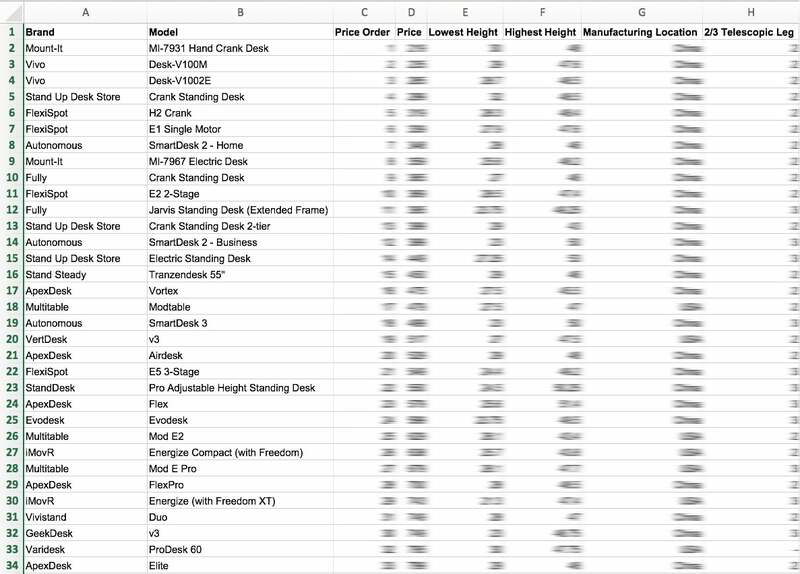 Being manual, it doesn’t have the higher price tag that many electric desks have, and still serves the same purpose in the end. In the end, if you are happy with a manual standing desk over an electric one, then we’re confident you’ll be happy with this one in particular.